Researchers at Scripps Institution of Oceanography at UC San Diego have developed a method for greatly enhancing biofuel production in tiny marine algae by genetically engineering a key growth component in biofuel. The researchers say a significant roadblock in algal biofuel research surrounds the production of lipid oils, the fat molecules that store energy that can be produced for fuel: algae mainly produce the desired lipid oils when they are starved for nutrients. Yet if they are limited in nutrients, they don’t grow well. With a robust diet algae grow well, but they produce carbohydrates instead of the desired lipids for fuel. 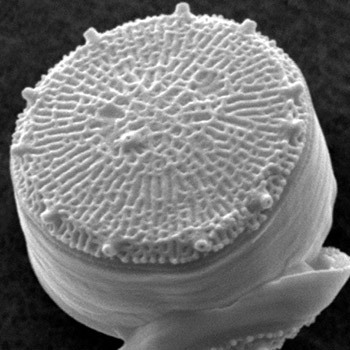 As reported in this week’s online edition of the Proceedings of the National Academy of Sciences (open access), Scripps graduate student Emily Trentacoste and her colleagues used a data set of genetic expression (called “transcriptomics” in laboratories) to target a specific enzyme inside a group of microscopic algae known as diatoms (Thalassiosira pseudonana). By metabolically engineering a “knock-down” of fat-reducing enzymes called lipases, the researchers were able to increase lipids (oils) without compromising growth. The genetically altered strains they developed, the researchers say, could be produced broadly in other species. In addition to lowering the cost of biofuel production by increasing lipid content, the new method has led to advances in the speed of algal biofuel crop production due to the efficient screening process used in the new study. “Maintaining high growth rates and high biomass accumulation is imperative for algal biofuel production on large economic scales,” the authors note in the paper. “Increasing lipid accumulation in microalgae is a major priority to boost the economic viability of algal biofuels, but growth and biomass are also important characteristics in large-scale production systems,” Trentacoste told KurzweilAI. “The specific enzyme targeted in this study is conserved throughout eukaryotes, and could be targeted in other production strains as well, thus these methods could be applied to many algal biofuel systems. The National Institutes of Health, California Energy Commission, Air Force Office of Scientific Research, Department of Energy, and National Science Foundation supported the research. Biologically derived fuels are viable alternatives to traditional fossil fuels, and microalgae are a particularly promising source, but improvements are required throughout the production process to increase productivity and reduce cost. Metabolic engineering to increase yields of biofuel-relevant lipids in these organisms without compromising growth is an important aspect of advancing economic feasibility. We report that the targeted knockdown of a multifunctional lipase/phospholipase/acyltransferase increased lipid yields without affecting growth in the diatom Thalassiosira pseudonana. Antisense-expressing knockdown strains 1A6 and 1B1 exhibited wild-type–like growth and increased lipid content under both continuous light and alternating light/dark conditions. Strains 1A6 and 1B1, respectively, contained 2.4- and 3.3-fold higher lipid content than wild-type during exponential growth, and 4.1- and 3.2-fold higher lipid content than wild-type after 40 h of silicon starvation. Analyses of fatty acids, lipid classes, and membrane stability in the transgenic strains suggest a role for this enzyme in membrane lipid turnover and lipid homeostasis. These results demonstrate that targeted metabolic manipulations can be used to increase lipid accumulation in eukaryotic microalgae without compromising growth.